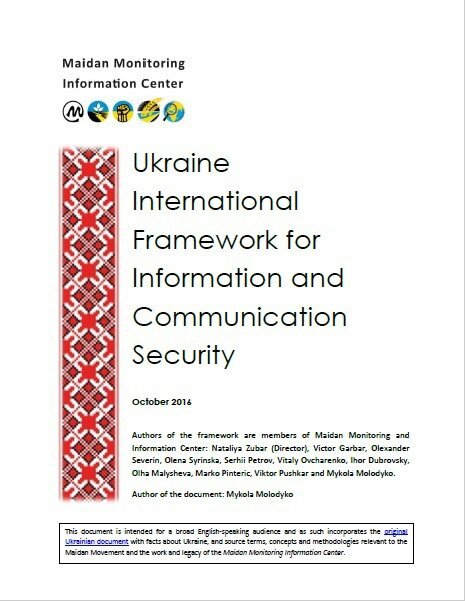 The framework is intended for a broad English-speaking audience and presents facts about Ukraine, source terms, concepts and methodologies relevant to the Maidan Movement and the work and legacy of the Maidan Monitoring Information Center. The framework provides for an international approach to countering, mitigating, reporting on and preventing hybrid warfare and terrorist threats, threat actors, vulnerability and risk at the community level through leadership, policy and strategy, and laws. 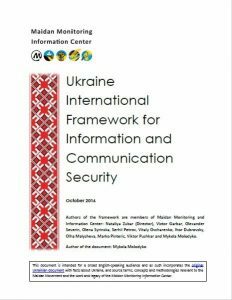 Within this framework of information and communication security for Ukraine, primary threats are established as those to the Ukrainian language and human values, the core of Ukraine’s history, culture and identity. The ultimate risk is identified as the assimilation of Russian [anti]values. Meaning, in simple terms that Ukraine would “turn into” Russia. Vulnerabilities are comprised of political, economic, social, technological, environmental and legal. Crosscutting vulnerabilities unique to Ukraine relate to leftover Soviet infrastructure, geographical closeness to its old Soviet neighbor, and historical falsifications imposed by its primary threat actor, Russia.